From a humble beginning, today hydropower is generated in over 160 countries, including Malaysia. 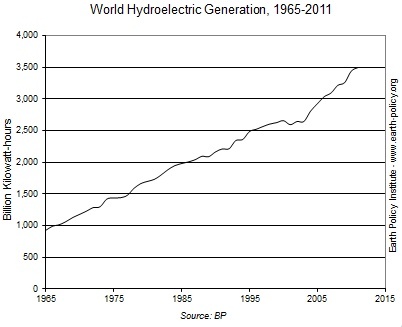 Study conducted by Earth Policy Institute, EPI, shows that global hydroelectric power generation has risen steadily by 3% annually since 1965. In 2011, hydroelectricity accounted for about 16% of global electricity generation, almost all produced by large dams around the world. 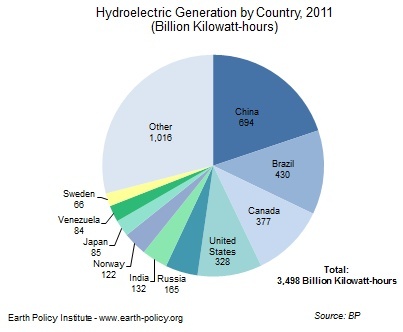 China, Brazil, Canada, and the United States dominate the hydropower landscape. Together they produce more than 50% of the world’s hydroelectricity, with China being the biggest producer of hydroelectricity. For the biggest hydroelectric producer, China, the growth has tripled from 220 billion KWH in 2000 to 720 billion KWH in 2010. 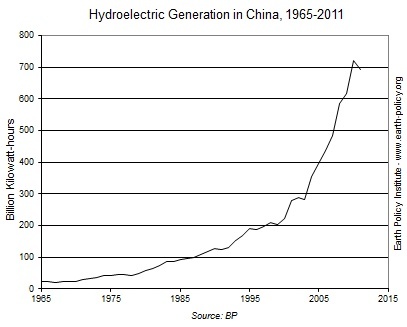 In 2011, despite a drop in generation due to drought, hydropower accounted for 15% of China’s total electricity generation. Brazil, the second-largest producer of hydropower worldwide, gets 86% of its electricity from water resources. It is home to an estimated 450 dams, including the Itaipu Dam, which generates more electricity than any other hydropower facility in the world—over 92 billion KWH per year. Third-largest producer is Canada. About 62% of its electricity is generated from the 475 hydroelectric plants. The country’s enormous hydropower capacity allows for electricity export; Canada sells some 50 billion KWH to the United States every year. This is enough to power more than 4 million American homes. Fourth-largest is the United States. Most large dams in the US were built before 1980, thus, the country’s hydropower capacity has remained relatively stable in recent decades. The country’s highest capacity dam—the Grand Coulee Dam on the Columbia River in Washington State—was completed in 1942. Today, more than 7% of all U.S. electricity is supplied by hydropower. Hydropower in the European Union is relatively mature, with capacity increasing by less than 1% annually over the last 30 years. In 2011, hydropower supplied 9.5% of E.U. electricity generation. 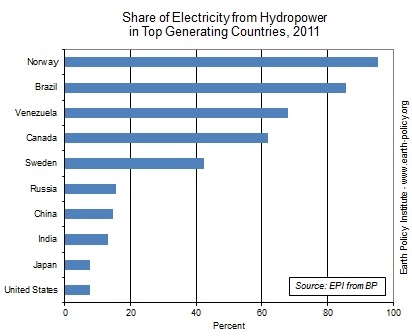 Among the world’s largest producers, Norway gets the greatest share of its electricity from hydropower: a full 95%. Other countries that get the bulk of their electricity from river power include Paraguay (100%), Ethiopia (88%), and Venezuela (68%). A number of African and small Asian countries also generate virtually all of their electricity with hydropower, including Bhutan, the Democratic Republic of the Congo, Lesotho, Mozambique, Nepal, and Zambia. Conventional hydropower continues to grow with dams completions in China, Brazil, Ethiopia, Malaysia Bakun), and Turkey. There is enormous potential for non-conventional hydroelectricity generation from tidal and wave projects, as well as from small in-stream projects that will not require new dams. South Korea - 254MW completed in August 2011 (world's largest tidal operation). Able to provide electricity for 500,000 people. New Zealand also recently approved a coastal hydropower project. Estimates from the World Energy Council indicate that worldwide, wave energy has the potential to grow to a massive 10,000 GW, more than double the world’s electricity-generating capacity from all sources today. Adopted from data highlight by Earth Policy Institute.